Heat oven to 450°F. Make pie crust as directed on box for One-Crust Baked Shell using 10-inch tart pan with removable bottom. Trim edge if necessary. Generously prick crust with fork. Bake 9 to 11 minutes or until light golden brown. Cool completely, about 30 minutes. Reduce oven temperature to 375°F. In medium bowl with electric mixer, beat cream cheese and sugar on medium speed until light and fluffy. Beat in 2 tablespoons amaretto and the eggs until well blended. Pour into cooled baked shell. Bake 18 to 22 minutes or until filling is set. Cool 10 minutes. Refrigerate at least 1 hour or until completely cooled and set. Just before serving, in medium bowl, mix preserves and 1 tablespoon amaretto. If desired, strain mixture. Stir in peaches to coat. 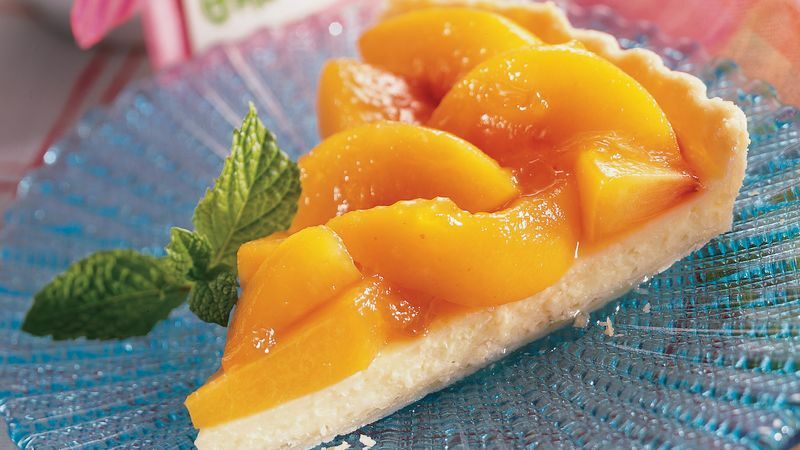 Arrange peach slices over top of tart. Garnish with mint leaves. Store in refrigerator.